Muttenz, March 8, 2016 – Clariant, a world leader in specialty chemicals, has released the Automotive Edition of ColorForward® 2017. This is the second year Clariant has formatted its color/trend analysis tool to meet the needs and interests of automotive designers and marketers. 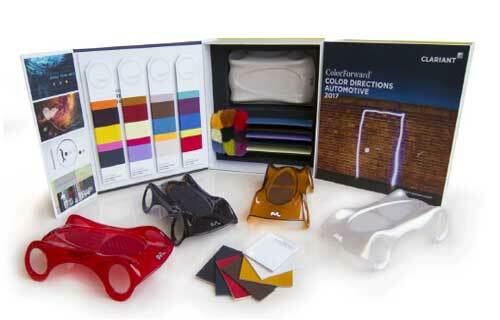 Clariant’s groundbreaking ColorForward trend-analysis and color-design tool has been released every year since 2006 to help plastic product designers and marketing professionals make more informed color choices. It presents four global societal trends that can be expected to influence consumers and then links them to colors that evoke an emotional response related to each trend. An anagram of the phrase “my information” is intended to capture the ambiguous, yin/yang nature of the information universe. Data mining, or the systematic sifting of digital information to achieve a specific purpose, is central to this trend theme. The duality of the web-world is captured in the annoy firm omit trend colors. Two of the five are dark and sinister. In a connected world, the last taboo is being lonely. “Delonelination is a wake-up call,” says Judith van Vliet. “It is a warning that loneliness is on the rise, particularly among young people. The five colors representing this trend are generally pale and muted, ranging from a beige to suggest the human need to be handled with care, to a plain brown. This theme can almost be seen as the antithesis of loneliness because it recognizes a trend toward complex connected relationships between multiple people who may be married or not depending on what gives them fulfillment. Colors representing this theme include a light green/yellow like the inside of a cucumber, and a diffuse red. There is a lilac purple and a brownish orange, almost cognac-colored shade. “Life can be a trap,” says van Vliet. “It can be hard and stressful – or just plain dull – if you allow it to become that way, and so people are beginning to seek new ways to break out, to be curious and explore the limits of the human mind. This trend is about escapism and finding new modes of perception.” Not surprisingly, the colors of this trend theme tend toward a funky new aesthetic.